Stonehill recently announced that we are strengthening our partnership with the JED Foundation (JED) by joining the JED Campus program. The nationwide initiative helps schools evaluate and strengthen their mental health, substance misuse, and suicide prevention programs and systems to ensure they have the strongest possible mental health safety nets. In the past, Stonehill has been awarded the JED Campus Seal, signifying the College's commitment to supporting student well-being and mental health. Now as a JED Campus, Stonehill will further refine that work through a thorough, comprehensive, and engaging process of reflection and growth. The program, which is enhanced by a grant from JED, is a multi-year strategic collaboration that not only assesses and enhances what is already being done to support students on campus, but also helps create positive, lasting, systemic change in the campus community. The program provides schools with a framework for supporting student mental health, as well as assessment tools, feedback reports, a strategic plan, and ongoing support from the JED Campus team. “We are committed to analyzing and addressing the mental health and well-being of our students. Doing so is an essential part of ensuring our students are best-positioned to succeed in their classrooms, communities, and careers,” said Vice President for Student Affairs Pauline Dobrowski. “The college years are the age when many mental health issues first manifest, and it can be a time of significant stress and pressure,” said John MacPhee, Executive Director of JED. “JED Campus helps schools by working with them to survey everything their university is doing to support their students’ emotional health and find practical ways to augment these efforts in a comprehensive way. We believe that the implementation of a campus-wide approach to mental health will lead to safer, healthier communities, and likely greater student retention,” he added. Stonehill’s membership in JED Campus begins with establishing an interdisciplinary, campus-wide team to assess, support and implement program, policy, and system improvements and completing a confidential, self-assessment survey on its mental health promotion, substance abuse, and suicide prevention efforts. Key staff members are currently completing the JED Campus assessment, to be followed by a Healthy Mind Survey for students this April. This summer, JED Campus clinicians will analyze the assessment and provide the College with a comprehensive feedback report identifying successes and opportunities for enhancements. Over the course of four years, the College will collaborate with JED to help implement enhancements. All self-assessment responses and feedback reports are confidential. In support of this initiative to promote the emotional health of our students and to enhance our outreach to prevent suicide and substance abuse, the College has created a dedicated 19 member cross-divisional JED Campus team of faculty and staff, including several senior leaders. Student input will also be crucial to this effort and outreach efforts are underway to recruit students to the JED Campus team for this coming fall. Interested students should reach out to Jessica Greene at wellness@stonehill.edu. Brian Oles, Director of Institutional Research and Assessment. If students, faculty, or staff are interested in getting involved in mental health or suicide prevention, they are encouraged to contact the Health and Wellness Center, wellness@stonehill.edu or Jessica Greene at 508-565-1544. 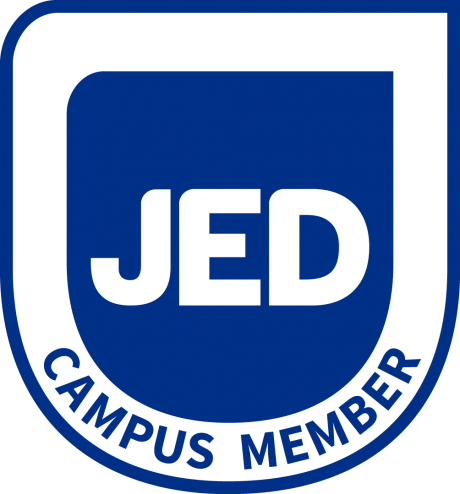 For more about JED Campus, visit www.jedcampus.org.